Oil-Electric: Blaine, Washington: It's All About Customs! Port Townsend, today. I went over to Blaine last week to spend a few days with my sister. As regular readers may recall, her condominium is as close to the Burlington Northern Santa Fe mainline as building codes and the railroad allow. While Blaine has a rich and colorful history with fishing, farming and timber, it's all about US Customs, Border Patrol, and the Ports of Entry between the US and Canada now. Canadian Authorities completed a state of the art and very nicely designed Port of Entry in time for the Winter Olympics. Work continues on modernizing the US Port of Entry. In March 2003, parts of the U.S. Customs Service combined with the Inspections Program of the Immigration and Naturalization Service, Plant Protection and Quarantine from USDA, and the Border Patrol of the Immigration and Naturalization Service to form U.S. Customs and Border Protection. 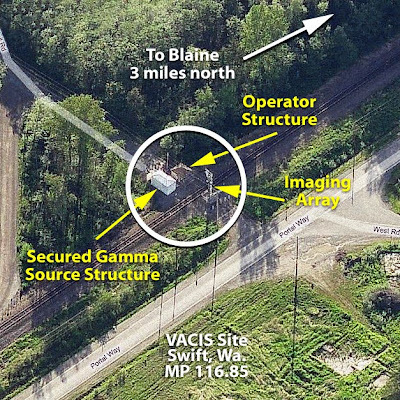 Gamma Ray detectors are located on the truck lanes at Blaine, and a gamma ray detector for scanning rail traffic, is located just south of Blaine at Swift. 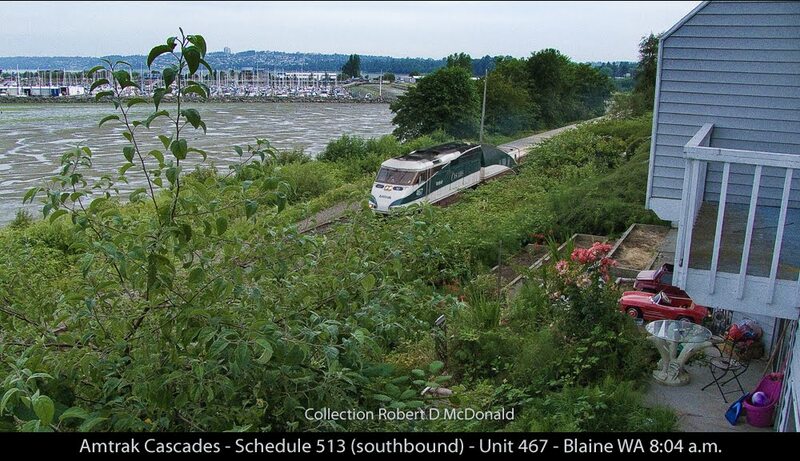 I hadn't considered Blaine a destination for the rail photographer. 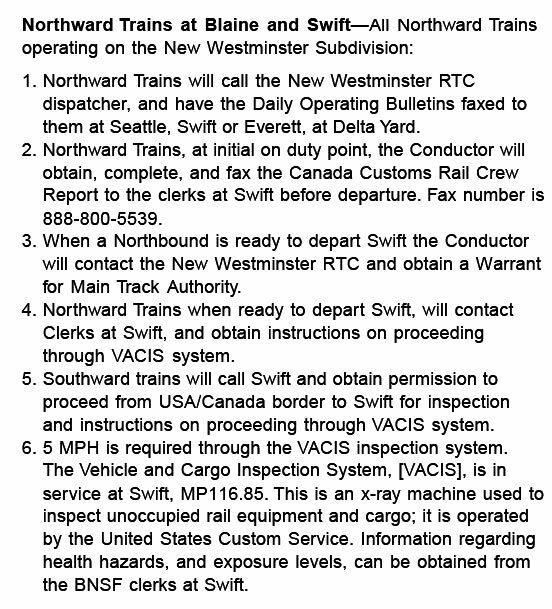 Two Amtrak "Cascades" each way offer Talgo push-pull service between Seattle and Vancouver BC, and a handful of freights, most running at night. And as you know, I've never developed a taste for GE "Toaster Ovens" or EMD "Big Mac's," keeping this Blog a "Toaster Oven Free Zone!" My sister's condo is three levels high, each level having a deck looking out toward Semiahmoo Spit across Drayton Harbor. 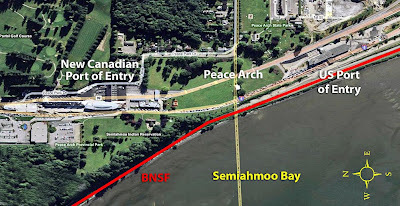 Just to the north is the old Great Northern Station, the Canadian Border and White Rock, BC. Leaning perilously forward off the upper deck, I could see the station looking very forlorn and forgotten, and behind it, the new Canadian Border Crossing facility. The ground floor, where visitors bivouac, has a fully equipped "mother in law" apartment, with a tiny deck facing the tracks about 30 feet away and down as much to track level. 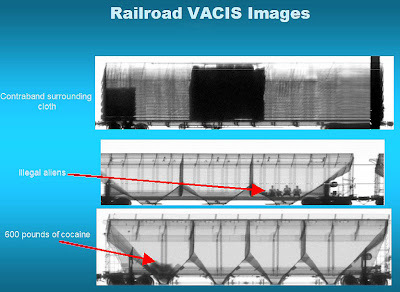 At this level, I would be just above the cab of speeding, or stopped locomotives; a factor that comes into play later. I've written a story or two on the Great Northern Blaine station Mile Post 119.3, which has failed so far to be salvaged by the residents of this border community. Too damn bad. Small towns need a focal point to attract dollars. And as I reported in "Shame on Blaine," that effort has gone unanswered. For all practical purposes, there is only one direction from which train photography is practical from this venue. From the north. 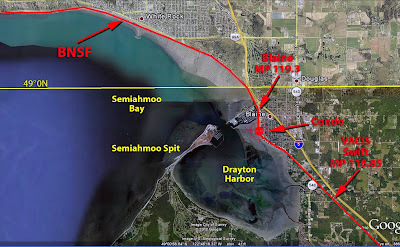 One can hear and see Burlington Northern Santa Fe freights and the Amtrak "Cascades" working along the water level route four miles away up at White Rock, BC, just north of Blaine. As I was fiddling around with my camera, I spotted this plate nailed to the ties. Perhaps you know its purpose and drop me a comment. I had to chuckle when it come to mind that starting with me in Blaine and ending with Steve Eshom in Vancouver Washington, including all the usual suspects in between, a locomotive could be documented passing the entire length of Washington State! 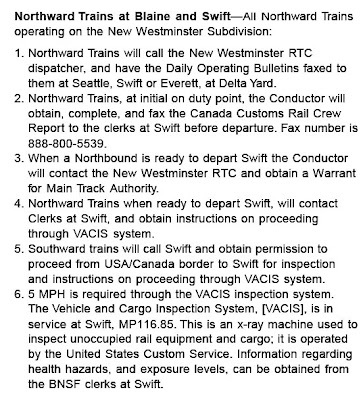 Northbound freight movements are impossible to shoot because there is virtually no warning of an approaching train. 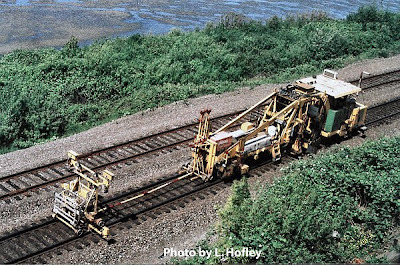 Heavy brush, a reverse curve right of way, and a crossing that requires annunciation more than a mile and a half to the south, give about five seconds of rumble before trains blast into view below the deck, at a startling 60 miles per hour! 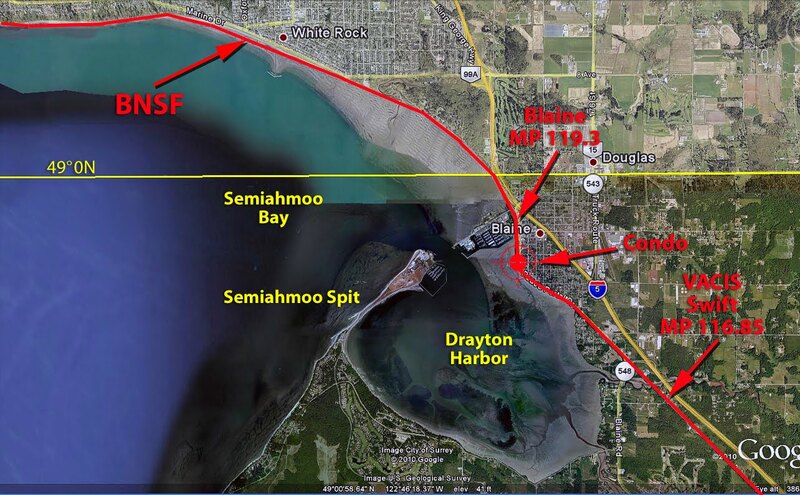 Straight across Drayton Harbor, Semiahmoo Spit. 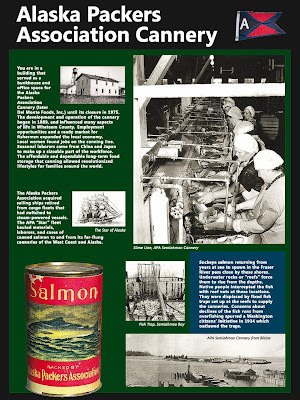 Once the sight of a massive fish processing facility, cannery activity on the spit began in 1891, and ran continuously through the closing of Alaska Packers Association in 1981. The old cannery buildings are surrounded by a beautiful resort and condominium complex. I highly recommend the fish and chip dinner in the pub! We were treated to a magnificent sunset. On the weekends in the summer time, you can ride Richard Sturgill's restored cannery tender, m/v "Plover." 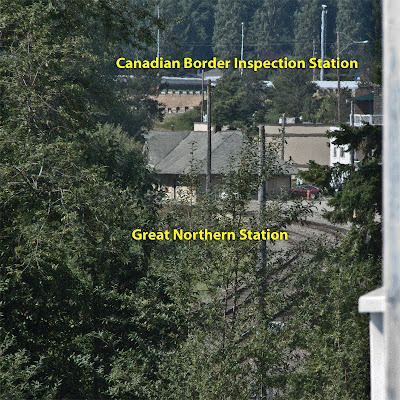 Richard still strives to save the Great Northern station. Who knows, he might let you steer the boat! A little more than a mile up Peace Portal Drive, formerly Washington Street, from my sisters place, impressive Peach Arch Park, with the 67 foot Peace Arch as it's center piece. This old photo, shot in 1925 is taken from the White Rock BC side of the border. 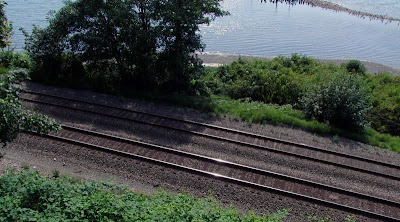 Looking carefully, you can see a Great Northern passenger train thundering into Blaine, heading south to Bellingham, Everett and terminating at King Street in Seattle. 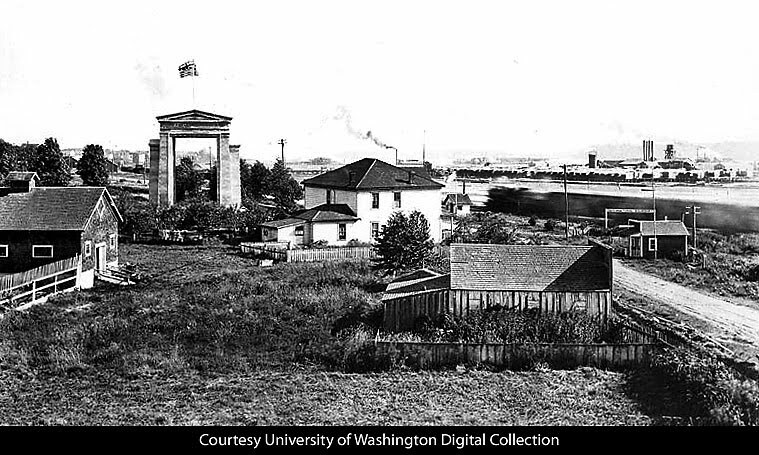 The tall smoke stacks are at a sawmill complex that once occupied the Blaine waterfront. Hard to visualize that between the Alaska Packers cannery and the sawmill, Blaine once boasted a population of more than 10,000 souls! Samuel "Sam" Hill (1857-1931), was the real force behind the creation of the Peace Arch. A wooden arch was built over the railroad tracks when the railroad border crossing was completed in 1891. 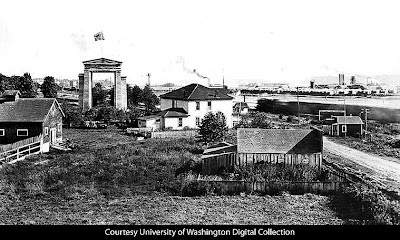 In July 1920 work began on the 67-foot-tall concrete and steel structure that we now know as the Peace Arch. 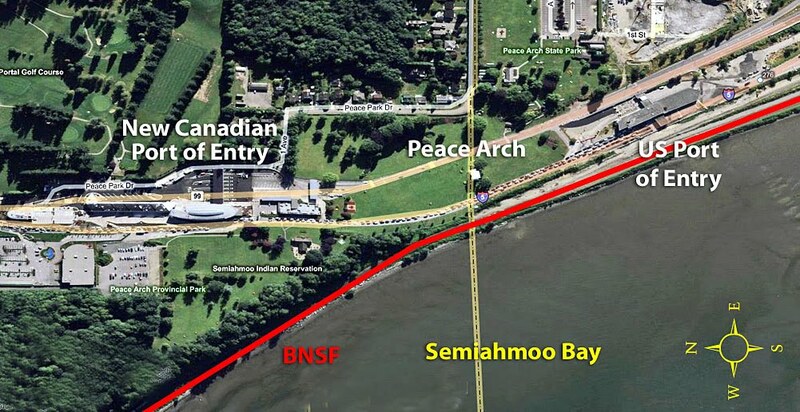 Built straddling the border between the United States and Canada, it features iron gates within the arch, symbolically permanently held open. Samuel Hill is often confused with James Hill, builder of the Great Northern Railroad. In 1886, Samuel Hill became a law clerk for the Great Northern Railway. Hill was a trusted advisor to president, James Hill, and two years later married his boss's oldest daughter, Mary. Two further confuse the careless; Samuel and Mary had two children, Mary, and James! I think this led to the phrase used by confused people, "What the Sam Hill?" But don't quote me on that. Today, Maryhill Museum, erected in 1907 as the Hill Family home site on 5,300 acres across the Columbia River near The Dalles, Oregon, was named in honor of his daughter. But lack of fresh water and logistics made living there impracticable. Sunset at my sisters home is unpolluted pleasure. The lights to the left are Semiahmoo Resort, on the tip of Semiahmoo Spit. The lights to the right, close, are Drayton Harbor Marina. In the distance, the lights on the hill are White Rock, BC. 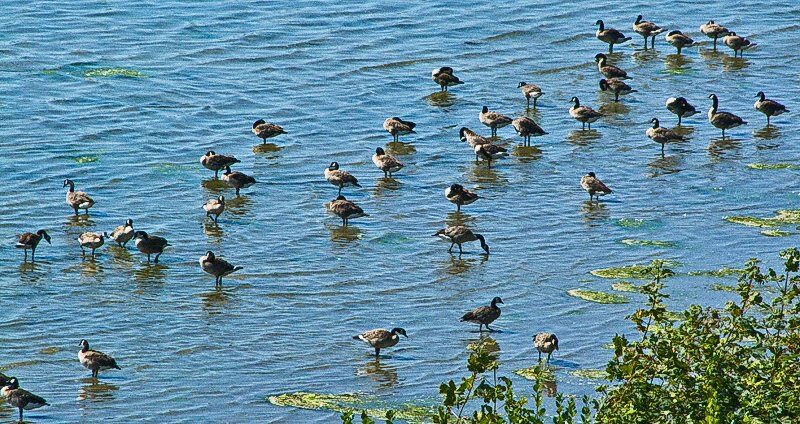 The tideland of Drayton Harbor is alive with Eagles, Great Blue Herons, and the gregarious honking of Canada geese and screaming seagulls, which continues unabated all night long! Freights run through at night. More specifically, between 11:00 p.m. and about 4:00 a.m. Cars with screwed up paperwork are dropped at customs until cleared for entry into the US. This means the occasional switching move, with the power packs ending up just about underneath my sister's condo; specifically under my bedroom window! This activity is not to be confused with the Vehicle and Cargo Inspection System (VACIS®) located at Swift, Mile Post 116.85, three miles south of Blaine. 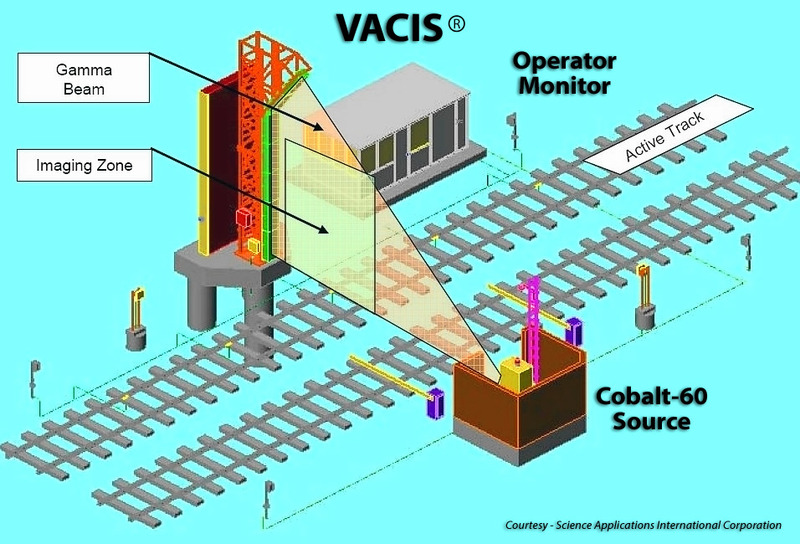 VACIS® uses a gamma radiation source, Cobalt-60, enclosed in a pencil eraser-sized capsule within a radiation proof "source holder." 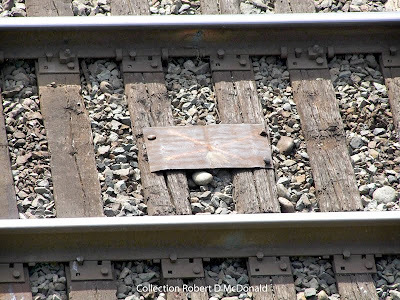 The radiation source is housed in a sealed, shielded locked building next to the track. As cars move past the scanner, gamma beans reveal interior contents. The VACIS® operator views images on a monitor. If a car contains suspicious shapes, Customs agents can conduct a closer inspection. Images are saved with radio frequency identification data, and car ID number. Sales literature claims "The radiation found outside the shield and the beam area is less than what a person would get from a variety of other existing sources of radiation, such as radon gas, X-rays in the dentist's office, cosmic rays or other sources." 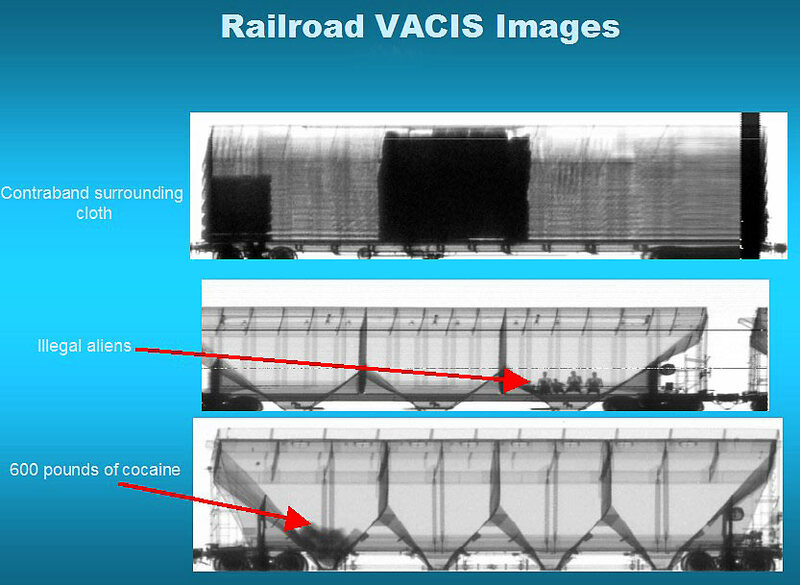 As to exposure inside a box car, the literature goes on to say, "You would have to ride a boxcar 2,000 times through the beam to equal the dose of a dentist's X-ray!" Uhm. Who tested that theory? Every time I've had an X-ray at the dentist's office, they give me a lead shield to wear; and I don't know of anyone who has had 2,000 dental X-rays! Can You "See More" at Night? I was just getting ready for bed when I noticed the trees outside lighting up! Southbound freight. I went up to the second level with the living room deck overlooking the tracks and turned on my camera. It was kind of a halfhearted effort; I mean what was I going to get? 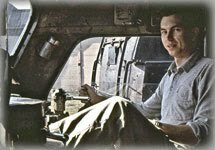 I'd forgotten about the hundreds of hours of audio recordings created by my late buddy, El Purington. I was with Elwin on many recording sessions around Seattle at venues such as Black River Junction on the Milwaukee Road, Covington Washington on the Northern Pacific, Horseshoe Bay BC on the Pacific Great Eastern, and Index Washington on the Great Northern. Can you "see" more at night? I'll let you be the judge. I have no idea what the power was on the BNSF freight, as they slowed down and stopped right below me. They were obviously four-cycle engines with that characteristic loping cadence. 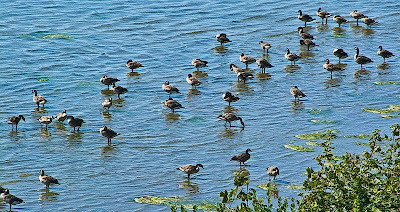 And if you listen carefully, you can hear the party animal Canada geese and seagulls in the background, raising a ruckus at 1:30 a.m. in the morning! Apparently had a car or two that didn't have proper customs papers, requiring further attention at Customs, were being spotted. Alternately, a car or two previously spotted were now acceptable for entry into the US, so they were being picked up. Too far up the track for me to know which it was. Finally, the hogger whistles off and begins working out of town. I did think the blast on the air horn next to a condominium with no crossing nearby was a little excessive. Movements up to that point had been executed without horn signals, obviously in radio contact with who ever the pin puller was. So what do you think? Can you "see" more at night? 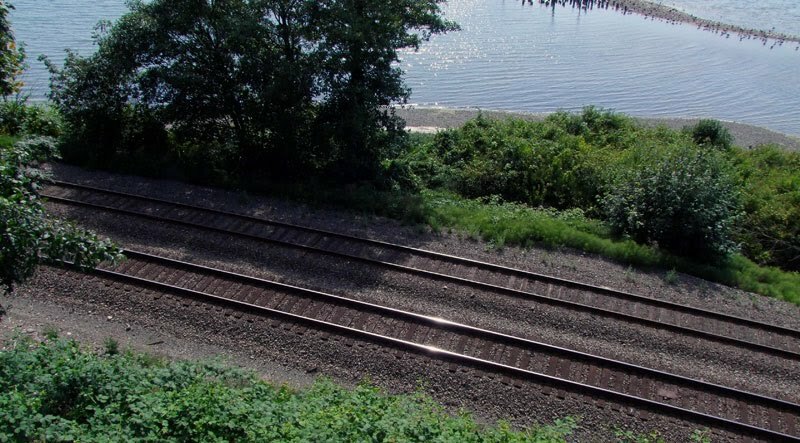 It wasn't until I got back home did I realize that Blaine, indeed, offers some great railroading experiences. You just have to be attentive! And through it all, I managed to keep my Blog a "Toaster Oven Free Zone!" Sound recordings don't count! 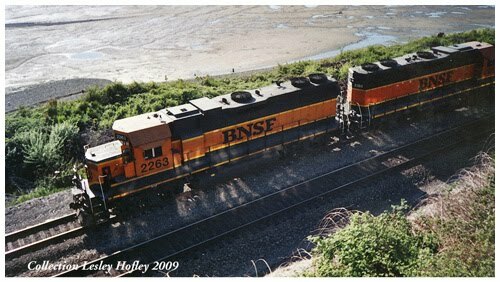 Railroad Stuff: BNSF 2263, nee SLSF 408, BN 2263. Built by General Motors, La Grange, as GP38-2, 16V-645E 2,000 hp. SN 73606-9, June 1973. Amtrak 467. EMD F59PHI (Passenger, "Hotel Power," Isolated Cab) Built 9/98, SN 966722-18, Engine 12V-710G3C-EC, 3,000 hp. The “I” in the F59PHI stands for “isolated cab”. In this design, the cab is isolated from the frame of the locomotive using rubber mounts. This reduces vibration and noise levels in the cab. It also reduces the wear and tear on cab located electronics and controls. 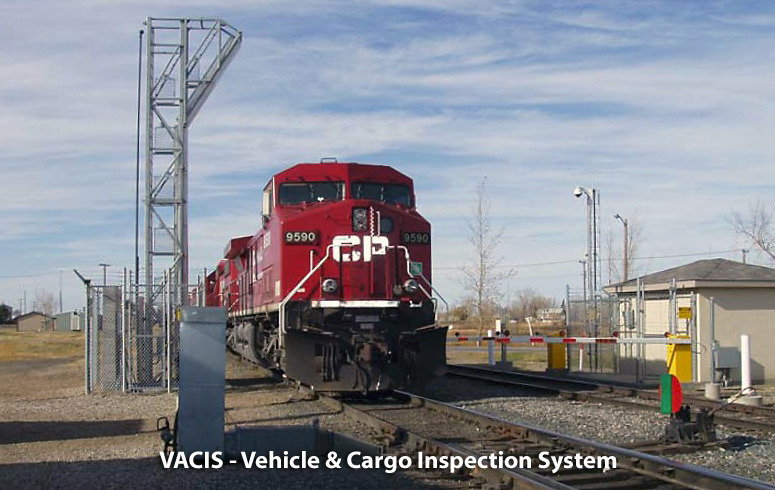 The F59PHI has an aerodynamic design, and the locomotive’s structure exceeds FRA crashworthiness standards. Head-end power (HEP - for car lighting and HVAC, which runs on AC, as opposed to the DC the engine generator produces) is taken from separate package in the locomotive. 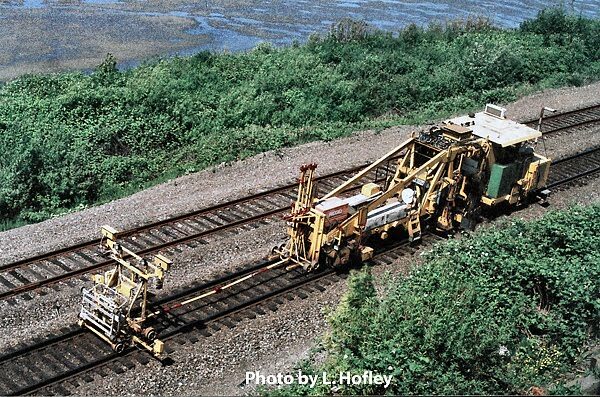 This eliminates the need for the diesel engine to run at a continuous speed even when standing still, which was one of the objectionable aspects of the predecessor F40PH model. This story makes 'plain Blaine's' nightlife really exciting- How I wish that this was the same situation when the magnificent Steam Locomotives would rumble through. Thank you for all the facts and effort.